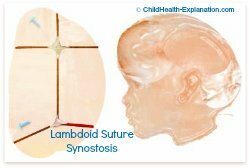 My 1 month old son has two overriding sutures on the head; one at Coronal and the other at Lambdoid suture. These overriding suture ridges were not there earlier. He was born full term by Caesarean section on July 25’ 2013. At birth and thereafter the baby was normal in all respects. His birth weight was 2995 grams and OFC - the head circumference was 35 cm. I recently noticed overriding of his skull bones. The head circumference (OFC) at the age of 34 days showed an increase of 3 cm. The doctor recommended X-ray skull and neurosonogram. Both the reports are normal. Now i am suggested to measure the skull growth monthly. But I am quite worried!!! Is it common for bony ridges to be felt at skull suture lines if the investigations are normal? 1. From the history given I understand that the baby was born of elective caesarean section and not after a prolonged trial of labor: For after prolonged labor trial we need to think of organised hematoma and skull bone fracture. However, both of these are readily diagnosed on the investigations your baby has undergone. 2. Another point that I would like to clarify before starting the discussion is; I assume from the case summary given that the infant does not have any signs suggestive of any genetic disorder. If not sure, it would be best to ask your doctor to evaluate the baby. 3. Overriding of sutures is also found in babies who are chronically dehydrated and are not feeding adequately. This can be ruled out if baby has expected weight gain and if the baby passes urine at least 6 times in 24 hours. Moreover, overriding of sutures that occur secondary to dehydration is generalized phenomenon and will Not show only on two specific sutures of the skull. 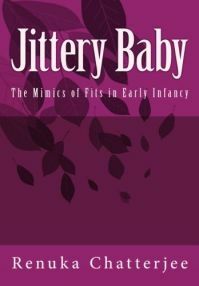 •	An error in the head circumference taken at birth – which does happen commonly for several reasons. 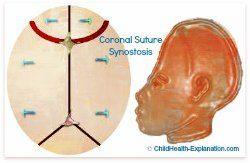 •	Secondly, overriding of skull bones at one or more joining lines suggests premature closure of those sutures (Craniosynostosis); especially when it is associated with palpable ridges specifically on two sutures in an otherwise healthy infant. Though rare (1 out of about 2000 babies born), craniosynostosis is seen in clinical practice. Precise underlying cause for abnormality in development of the skull is unclear, but in up to 20% of cases genetics is the cause. Therefore it would be in order to re-evaluate the baby and rule out the possibility. 1. It could be a very early stage of craniosynostosis, and you - a very vigilant observer. 2. X ray skull can often be deceiving in first 3 months of life. 3. Neurosonogram evaluate the status of the brain, possibility of hydrocephalus and hematomas. It is not a good check for status of the skull bone sutures – that too at an early age of 1 month. 1. Keep a close check on head circumference. Your doctor may want to wait till baby is 3 months old before confirming the diagnosis. Every 15 days take picture of the head from top as shown in the illustrations above. Abnormal head shape will help arrive to the diagnosis. If need be shave baby’s head. 3. Fontanelle: Record the size and the feel. Craniosynostosis may lead to increased intracranial tension due to rapid brain growth of infancy. Any indication of increased intracranial pressure warrants early intervention. Babies suffering from high pressure within skull present with excessive crying, irritability or vomiting, and may have bulging and tense fontanelle. 4. 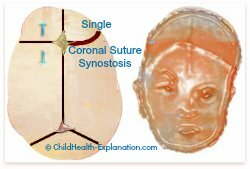 Skull bone scan is usually diagnostic for craniosynostosis. Why wait if diagnosis can be confirmed? If increase intracranial tension does not demand early treatment, most doctors prefer to wait till baby is 3 months of age. This is to be absolutely sure of the diagnosis. However, between 3 and 6 months of age surgical intervention is even considered for prevention of craniofacial deformity. My son is 10 days old. I can feel ridge at the whole length of the lambdoid suture. It looks like the parietal bones overriding the occipital. He had vaginal delivery with forceps. His HC at birth was 35.